It's been over two decades, but a sequel to 1988's post-apocalyptic RPG Wasteland is officially in the pipeline. Brian Fargo, founder of Interplay and inXile, launched a Kickstarter campaign earlier this week to raise $900,000 -- a goal reached in only 42 hours. "Woot!!! We did it!!!! Fantastic! I am going to sleep like a baby tonight. Once again I am awed by the support! A dream come true today," Fargo said. 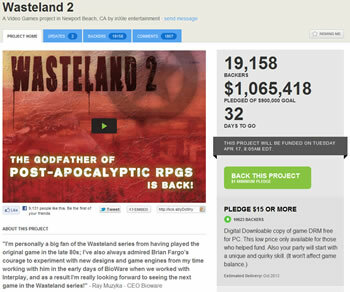 As of writing, 19,000 eager fans have pledged more than $1 million, including several $10,000 donations from industry figures such as Razer CEO Min-Liang Tan, who apologized for pirating the original Wasteland. "I hope this makes up for it," Tan tweeted. Executives from BioWare and Blizzard also backed the project, acknowledging Fargo's previous accomplishments in the role-playing genre. Although the original goal was $900,000, Fargo acknowledged the possibility of exceeding that target with Double Fine recently receiving more than $3 million (they only asked for $400,000). Preparing for such a scenario, he outlined what inXile do with the additional funding. At $1.25 million, the extra cash will go toward expanding the world and adding more maps, stories and music. At $1.5 million Wasteland 2 will receive even more in-game content and it'll be ported to Mac OS X. "After $1.5 million the sky is the limit," reads the Kickstarter page. With 32 days to go, it's safe to assume Fargo and his crew will receive just as much support as Double Fine, if not more. Folks who pledge $15 or more are guaranteed a DRM-free digital download of the game when it launches, as well as a "unique and quirky" in-game skill. If you submit $30 or more, you'll also receive a DRM-free digital soundtrack by Mark Morgan and a digital Wasteland 2 concept art book. Pledge $50 or more and you'll get a boxed copy of Wasteland 2, an early release Wasteland 2 novella, a worn cloth game map and more. There are nine more funding tiers beyond that leading up to $10,000, which gets you invited to an exclusive party with Fargo in Californa, an in-game shrine constructed in your honor, 50 copies of the game and a medal. Wasteland 2 is on track for release in October 2013.